Yes, dear reader, the time has come. Everything in life has a beginning and an ending, and I believe that it’s time to wrap up The Greening of Gavin blog and podcast. All good things come to an end (to quote a very famous Star Trek series)! It’s with a home brew beer in hand that I say goodbye. 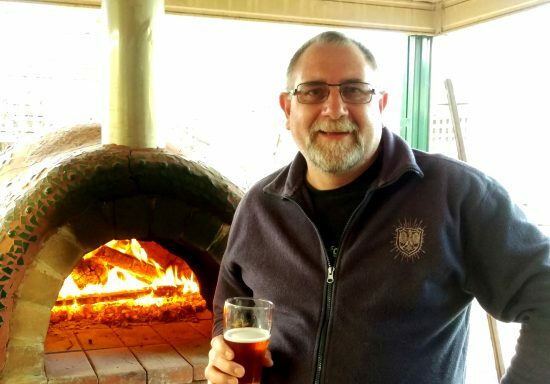 With no major greening projects on the horizon or further lifestyle enhancements planned, I’ve essentially run out of things to say, which after 1,870 posts and 132 podcast episodes is quite understandable. I’m officially passing the baton to a younger generation of bloggers and influencers who may have better luck convincing the masses further to live a more sustainable lifestyle. I know that I’ve played my part in the rebirth of the simple living revolution judging from the amount of feedback and emails I receive every day, so I feel very proud of that accomplishment. I, like you, can make a big difference in the world. During the journey, we’ve retrofitted the house with many green features, renovated the gardens into an organic food farm, and transformed the way we think and live. All that, as well as starting a green business teaching others some simple living skills. When I reflect back to that crazy day when my whole world was turned upside-down, I would never in a million years have thought that the blog would have come this far and how it would eventually have impacted our lifestyle for the better. And to you, the reader. I thank you from the bottom of my heart for supporting and following my family’s journey and antics since February 2008 when I penned the very first post. It’s been a wild ride, sometimes controversial, but always interesting and fun. Well, the blog posts and podcast episodes will remain online until the either the internet is destroyed or peak oil begins to impact us all. Just joking, it will still be here as a valuable resource for as long as there are bits and bytes. Check out my archive for all the posts. The eBookstore will remain open as well where you can buy the six eBooks that I’ve written over the years. Check out shop.greeningofgavin.com for all those books, including the free The Greening of Gavin eBook! Also, I will still have a strong online presence as I will be maintaining the associated Facebook page and YouTube channel for The Greening of Gavin. If anything exciting happens around here then that is where I will be posting this type of update. 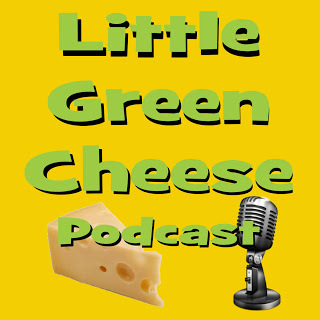 Additionally, the YouTube channel, CheeseMan.tv, will continue to release a weekly cheese making video, as well as my cheese making blog and associated podcast at Little Green Cheese. To cap it all off, our home business, Little Green Workshops, is still growing strongly and will more than compensate for any time I gain from ending the blog and the podcast. We are still running cheese, soap, soy candle, and bath soak & scrub workshops each school term if anyone wants to learn these dying skills. You can find all the details of these courses on our workshops calendar. Click Through to the Shop! So dear reader, this is it. Once again, thank you from the bottom of my heart for all the support, and I hope to see you on my other blogs and YouTube channels in the very near future. Goodbye, my friends and keep on striving for a more sustainable world. 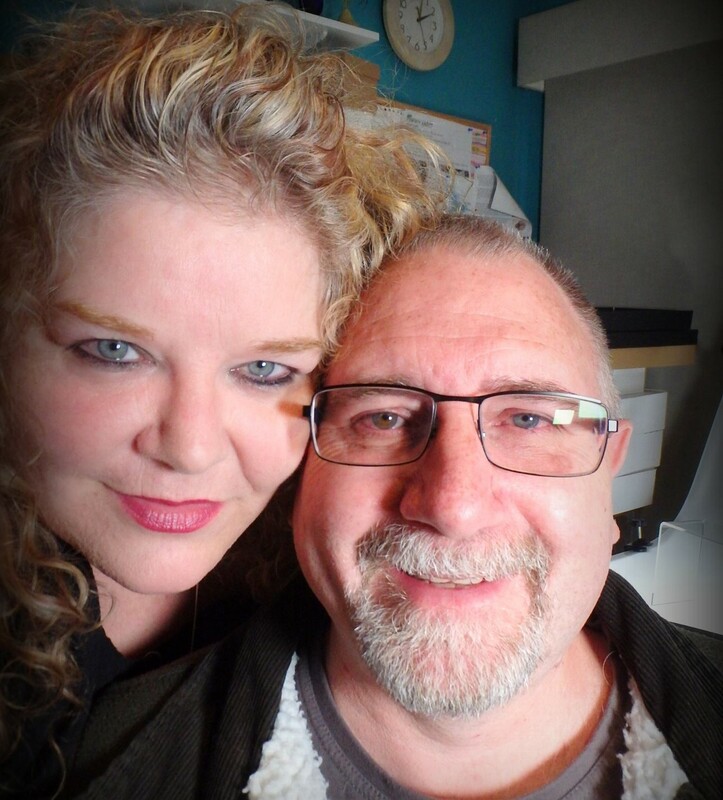 Many of you may know that Kim and I run a small home based green business called Little Green Workshops. 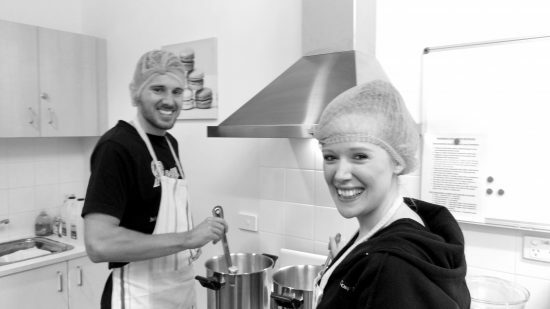 We teach cheese, cold processed soap, soy candle, and bath soak & scrub courses at our local community centre. We also sell kits, supplies, and gifts for anyone who is not close by. 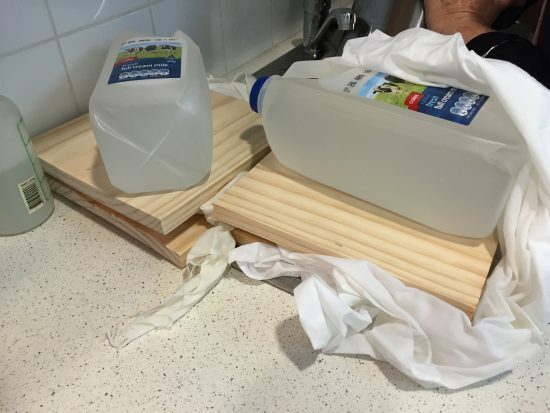 We got the inspiration to start this venture because many of you asked for more information about how we make and do some of the things we perform on a weekly basis, living a more sustainable lifestyle here in the ‘burbs. Many of you may be wondering how it is all going. Well let me give you an End of Year update. We are pleased with these statistics, especially when it is only our 1st full year and 20 months of operation. We are also very proud of what we have achieved so far and are seeing sustainable growth month on month (besides the Christmas spike). You know I’m a fairly modest bloke, but it’s taken a lot of hard work to get where we are today. They say that many small business tank in the first five years due to debt overload and other factors. We haven’t taken out loans or borrowed to support the business. I’m one who believes that debt is a form of slavery in disguise, so we have avoided this as we’ve started up. And because of it, we sleep better at night! Thankfully due to the low startup cost of setting up and maintaining an eCommerce presence on the Internet, and in part this blog and our YouTube channels, we have been able to reach a wider audience of students than we would normally have been able to. Students who are keen to learn and create their own sustainable products, knowing exactly what goes into them and keeping it all natural. We also began regular shipping to five new countries besides Australia this year due to demand; New Zealand, Canada, United Kingdom, United States, Ireland, and South Africa. All in all we are ecstatic that we’ve kept managed to our core green values in every business decision we make. Sustainably sourced packaging, avoid single use products and plastic, run a carbon neutral worksite and websites, and sell products where others can make and do instead of just consume. So as a special thank you and a gift for you, and to share in the success that you have helped to create, we have just launched a limited two-day sale over at Little Green Workshops, offering 10% off all products (excluding course bookings). Sale ends at 2359 hr (midnight) 30th June 2016 Australian Eastern Time. Thank you once again for reading, watching, and listening to our blog posts, podcasts, and videos during the last 12 months and following our sustainable living journey. Without you regularly visiting this site, I would still be a conspicuous consumer, unmotivated to strive to be greener, stuck in the rat race, plodding through life in misery. By being able to share our sustainable living journey with you, I’ve given myself permission to live, love, and enjoy life to the fullest! This weekend was so much fun. 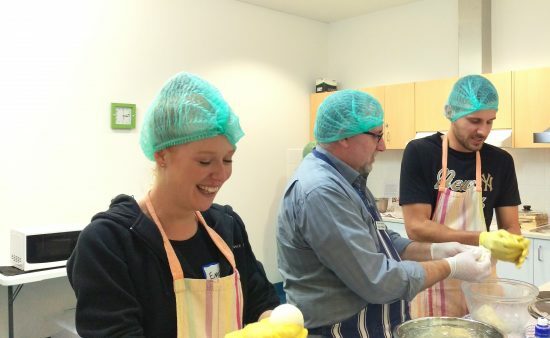 I taught my first three cheese beginners cheesemaking course. 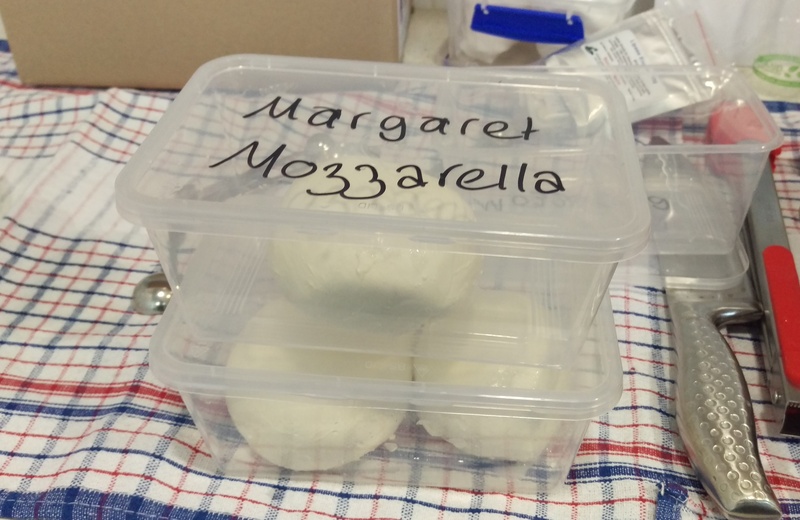 Yes, I had taught cheesemaking courses before, but just mozzarella and not in long form. 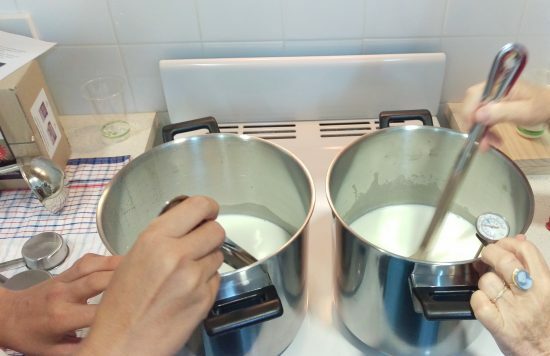 My new course was 5 hours 30 minutes long and the students learnt how to make three basic cheeses; Paneer, Whole milk Ricotta, and Quick Mozzarella. So let me share the day with you. Kim and I set up the training kitchen with 30 minutes to spare before the class started. 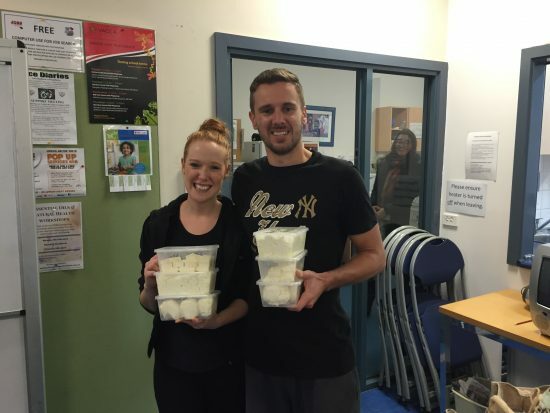 The cost per student was $130, and they received a 30 minute Mozzarella and Ricotta Kit, two wooden cheese boards, and all the cheese they made on the day. 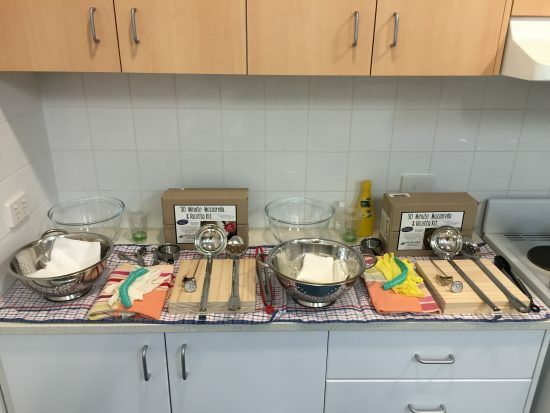 We had great feedback from the students that it was great value for money and that they only booked on it because they learnt how to make three cheeses in a day. So lets meet these students shall we? Emily and Petar were a lovely couple who were from Melbourne. Both had a wonderful thirst for cheese knowledge and asked many pertinent questions during the day. Gavin (that’s me), with Pip and Margaret. Pip travelled from Melbourne, however Margaret travelled all the way from Biloela in Queensland! She is one dedicated curd nerd. Both had a great sense of humor and it made the day a pleasure. So let’s have a look at the cheese that everyone made. Before we touched the first drop of milk, I taught them how to sanitize their cheese making equipment and utensils and how to keep their work areas clean during the cheese making session. They sanitized all their gear in between each session to ensure hygienic practices. Paneer was the first cheese they made. To make this cheese, you are required to boil the milk then add natural yoghurt and lemon juice. 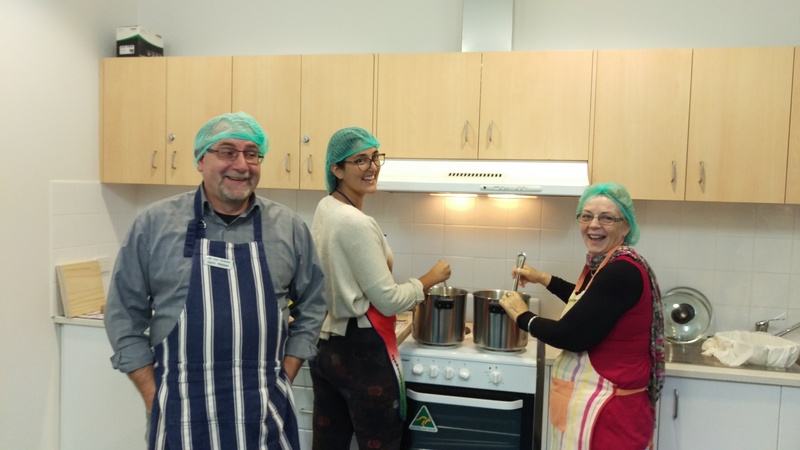 Unfortunately it took a little longer than expected, because the electric stoves we had a hand in the training kitchen wouldn’t get hot enough to boil the milk! I’ve never had this issue on a gas stove top. It was starting to burn on the bottom, so I quickly made an executive decision and instructed them to add the extra ingredients at 90-95°C. It’s then drained and pressed between two boards with 2kg of weight. 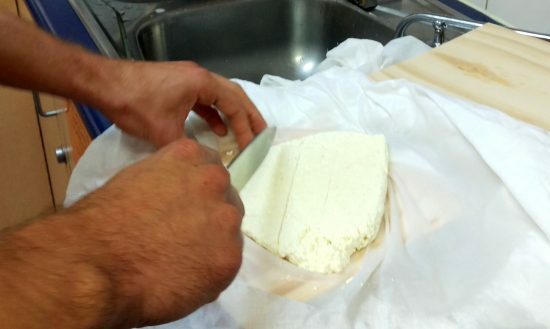 Fortunately, this worked and after 30 minutes of pressing in butter muslin, all students created their own Paneer. I think they were going to make a curry to use it in. Next cheese was Ricotta, which I don’t have any photos of. Suffice it to say that everyone’s Ricotta was successful, some making it really soft and others making it a little firmer. 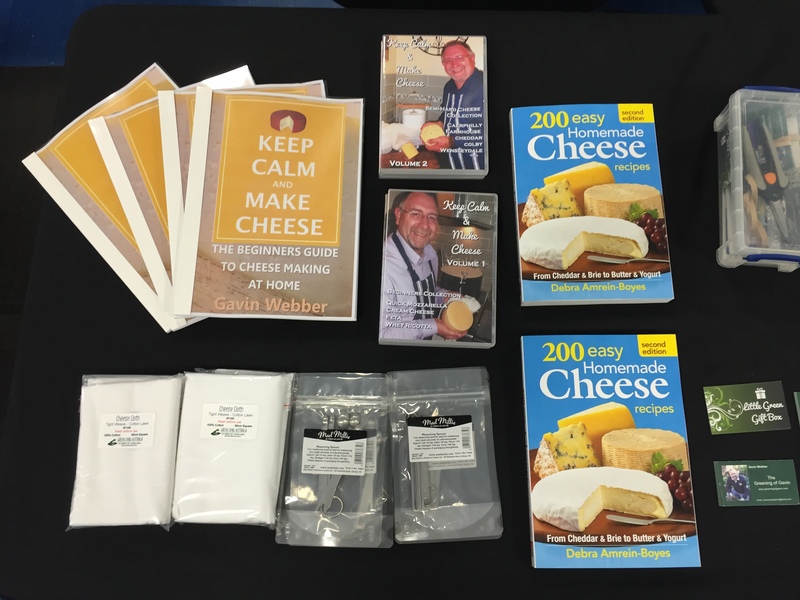 I have a special recipe that allows you to vary the softness of this cheese, which all students got to take home. There was so much of it, that each batch just fit into their 1 litre containers. 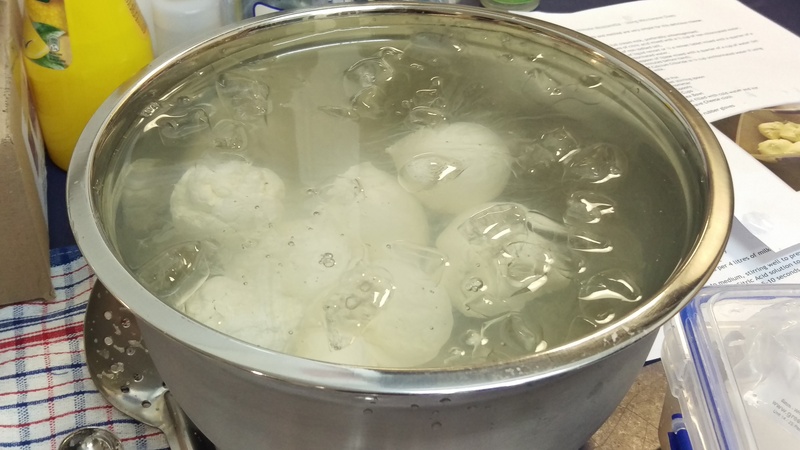 After lunch we made the final cheese, Mozzarella. This cheese only takes about 30 minutes to make and is of the pasta filata family of cheese. All students were successful, although Petar need a hand to form the cheese for stretching (I don’t think his milk was acidic enough). As it was his first try, he was still happy with the result and knew how to fix it next time he makes Mozzarella. Once the curd has been stretched and formed into balls, they immersed the balls into iced water to cools down quickly so they keep their shape. Here are some Mozzarella that Margaret made, ready to take home. Each proud student asked me to sample their cheese, and all were as I expected; delicious. At the end of the day’s class, the students volunteered to wash up which was unexpected, but very welcome. I had a few cheese making items for sale at the end of the class. Mostly books and gear that wasn’t supplied in the kit that we have for sale at Little Green Workshops. 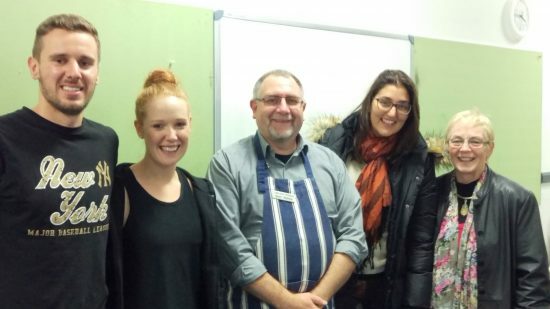 Everyone were so happy with their cheese and the course that we even had class photos! Here is Emily and Petar with their cheese. Emily is holding her cheese in the following order, Paneer (top), Whole milk Ricotta (middle), and Mozzarella (bottom). That’s Pip in the background photobombing! Before they all went their separate ways we had a class photo. There were smiles all round. Beginners Cheesemaking Class Photo: L to R; Petar, Emily, Gavin, Pip, and Margaret. Anyway, so far this school term, our course has been extremely popular. We had only planned to teach one course this quarter, however due to demand, we put on another class on 5th June, which has subsequently been booked out. We were then asked to schedule another Beginners Cheesemaking course for 7th May, which now half full and only has two places spare. I think we’ve hit upon a winning cheese class formula! We were even asked by Margaret to see if we could teach an advanced cheese making class, so we are giving it some thought. It may have to be held over two days. So, well done to our four new curd nerds. May there be many more cheese to come!